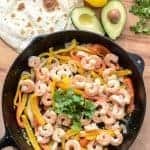 Shrimp fajitas are one of my favorite 20 minute meal ideas that the whole family loves. They come together fast and are full of vegetables! 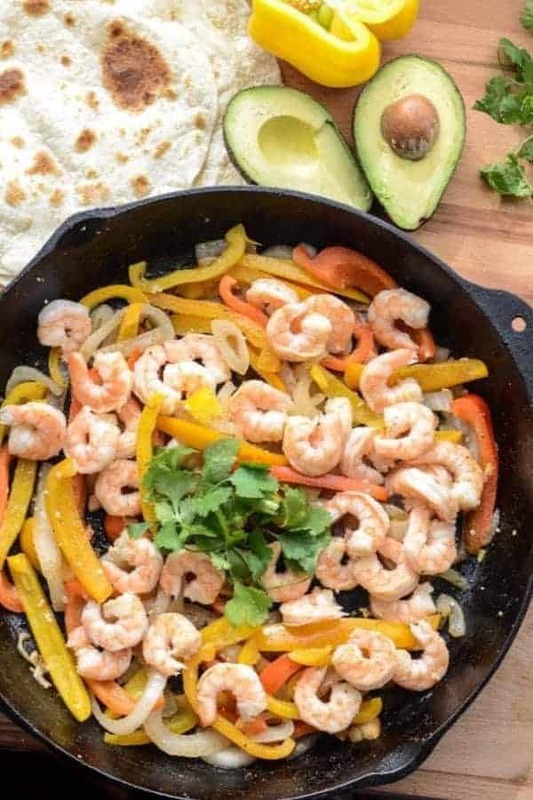 Shrimp Fajitas are one of my favorite super quick meals to make. Shrimp is a bit of a splurge but it’s so very good once in a while. I love it because it does cook up fast and that means dinner is done in a hurry. I like to make this on a Friday night when I’m not eating out but wish I were. The shrimp feel extra fun, it’s easy which means I’m not in the kitchen all evening, and if you can put guacamole on it, I’m in heaven. Make this recipe friends, you are going to love it! My kids are crazy for shrimp, but I won’t let them pick them out of the pan to eat. 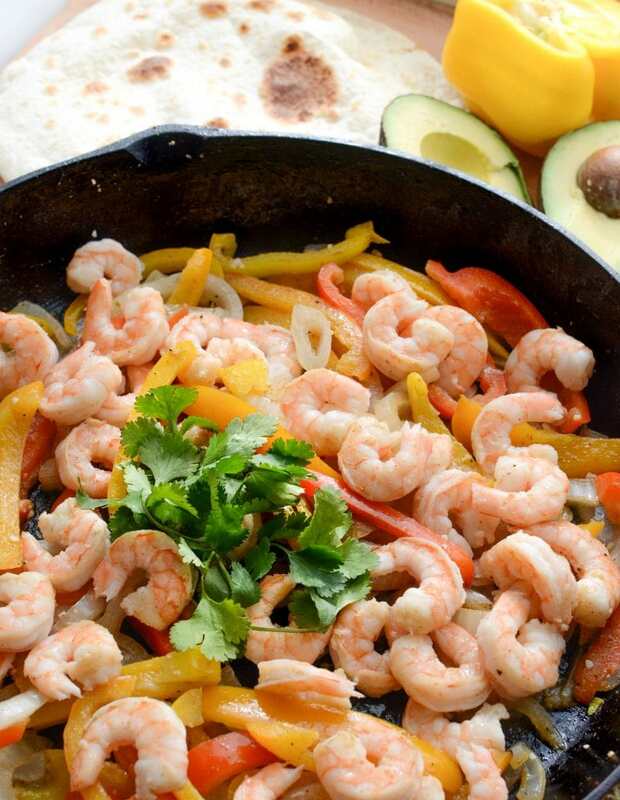 If they are going to enjoy the shrimp, they get a scoop of the fajita mixture in a tortilla or on their plate. They get to eat the peppers along with everything else in order to enjoy the shrimp. They get shrimp, I get the satisfaction of knowing they ate a few vegetables. Also, I like to use the colored peppers because they are sweeter and less bitter than just green peppers. If shrimp isn’t your favorite, you can replace it with chicken or steak, just be sure to cook and season the meat properly. If you’d like to grill the shrimp on the grill instead of cooking it in the pan that would also be really delicious. If I forget to thaw the shrimp in the afternoon, I’ll just put the frozen shrimp in a colander and run them under cold water for a minute and then changes the water temperature to just tepid. They thaw in just a few minutes and I’m ready to roll. How long does it take to cook shrimp? Shrimp cook super fast, usually 2-3 minutes depending on the size. Don’t overcook or they will get tough. The exterior should be pink and the flesh opaque. Preheat a large skillet over medium high heat. Add the butter and garlic and stir until the butter is melted. Add the shrimp and cook, stirring often, until the shrimp turns pink, about 4 minutes. Remove the shrimp from the pan and carefully wipe out the pan. Return the pan to medium high heat and add the olive oil. Add the peppers and onions and cook until the peppers are tender-crisp, about 5 minutes. While the vegetables are cooking, remove the tails from the shrimp if they came with them on. Add the cumin, salt and pepper to taste, and the juice of one lime, stir to combine. Add the shrimp back to the pan, stir, cook until the shrimp are warmed again and then remove from the heat and serve right away. Serve on warm cooked fresh tortillas with cheese, salsa/pico, avocado and/or black beans. Notes: If shrimp isn’t your favorite, you can replace it with chicken or steak, just be sure to cook and season the meat properly. If you’d like to grill the shrimp on the grill instead of cooking it in the pan that would also be really delicious. This year has been one of growing pains for the blog. 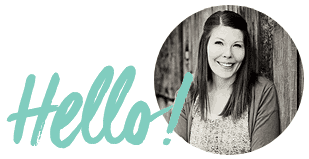 I’m in the middle of getting an email list all set up (it’s harder than it sounds), I’m working on collecting emails via popups (hello, free smoothie book! ), I’m learning Adobe Lightroom for editing, I just finished a freezer to slow cooker ebook that took me 5 months to finish (it’s at my designer! I can’t wait to share it), and I just decided to write the book I’ve had in my head all along, something along the lines of weight loss, real food, and feeding a family. For the last few years I’ve been trying to decide who I am as a blogger. Now that I have figured that out, I realized that it isn’t about me. It’s about you. Now I need to figure out who YOU are, dear reader. Who you are and how I can help you. Being helpful is the most important thing I can do for both of us. Here’s who I think you are – intentional parents, mostly moms, who want to do a good job feeding your kids healthy/real food but aren’t against treats now and then. You are pretty well-balanced when it comes to eating but you always feel like you could be serving a few more vegetables and a few less treats. I also think you are busy and the “what’s for dinner?” question is always lurking in the back of your mind. 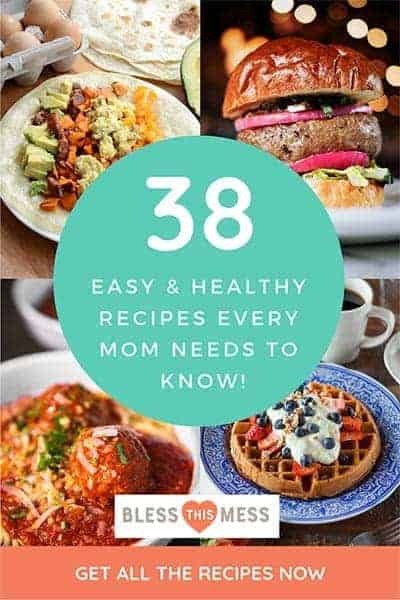 You like fast, family friendly, whole food recipes that don’t cost an arm and a leg or include too many odd ingredients. Is that close? Tell me I’m close 🙂 Tell me who you are! How can I help? What do you need? Now I’d love to help you with your wardrobe and makeup but that isn’t going to happen (I need my own help with all that), but when it comes to food, planning, food prep, mom life, and that kind of thing, what is your biggest struggle? I’m going to give away a $25 Amazon gift card, at random, to anyone who answers these questions in the comments. I so value your time and I’m so grateful you are here. Thank you! A book! How exciting!!!! You nailed it on the head with who I am. I am the busy mom who lives less than a mile from five different fast food places, with another three only two miles away. It’s literally faster, and usually cheaper for me to go get food for my family instead of prepare it. Good thing I know how important good food is! But it still needs to be fast 😛 Our main meal of the day is lunch since my husband works nights, and with homeschooling in the morning, I often lose track of time. So it’s usually either something super fast, or fast food. I love all that you do here – keep up the good work! I am a working mom who has always been a collector of recipes. I first cooked dinner for my family when I was 6 years old. I used to read cookbooks for pleasure, but now I just collect recipes. I have lots of cookbooks and love to cook from them. I can’t remember how I found your blog, but it has been fun for me to get ideas from you. Because I am busy, I usually try to have something quick in the pantry or fridge to make. We do Dream Dinners, but not every day of the week. Your blog helps me have an idea in the back of my mind for when we’re just cooking dinner from scratch. I used a bunch of your stuff for Thanksgiving dinner. I also enjoy seeing how you do what you do and knowing that there are other busy moms out there making life fun for the kids. Yep, that’s exactly who I am. I love easy, normal ingredient food. Yup, the big question….what’s for dinner? 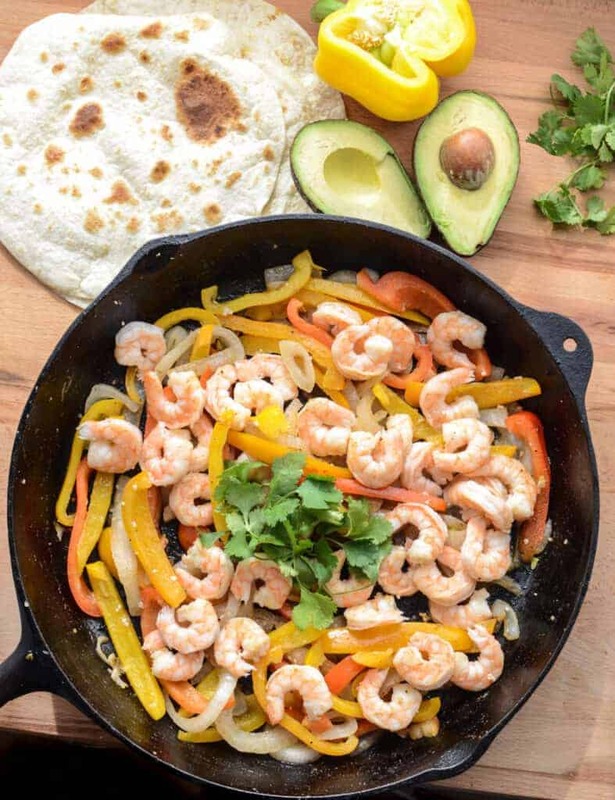 Tonight it was Shrimp Fajitas…thanks! Next time I will back off on the cumin….the poor shrimp were overpowered. A fresher, juicier lime would have been better too….mine should have gone to the compost monster a week ago, but hey, you do what ya gotta do! Mr. Picky wouldn’t eat the peppers and I couldn’t pull the mom card on him. Yes, you are right, I am already trying to figure out what is for dinner tomorrow night! Grrrr… its a never-ending problem! I have just started learning about freezer crock pot cooking….. your book will be a blessing! You have done all the experimenting and fine tuning for me….I like you! I hope you aren’t trying to re-invent the wheel….your wheel has been rolling just fine! How’s the chickens? Yep, you know your audience 🙂 I find it helpful when you demystify the less-common ingredients that I’m scared to try on my own (like quinoa, brown rice, healthy stuff like that.) I also like hearing how you tackle family issues and how you’re working towards your dreams with the house and your farming and all that. It’s encouraging! I’m not a mom (yet) – I only just got married in August! I’ve been reading your blog way before even getting engaged, though. Having learned to cook at a young age, and cooking dinner for my family (and now my husband) ever since, I love having ideas for meals. Especially healthy, quick, easy meals. That’s not why I started reading your blog, though. Your blog drew me in with the stories of the things you were finding in the walls (I had to read those posts way after they were posted, but they were so interesting! ), and hearing your dreams for building your own house (and now it’s actually happening)! I loved hearing stories about your family, your life, and your faith – and dreaming that someday I could have a similar situation. That someday, I could raise my own children, and even have chickens, too. Often times, your blog appears in my email folder, and I have to come back to it later (like this post) because I can’t get to reading it right that moment. When I get the chance to read your posts, though, they are always worth it. Thank you for sharing your world with us. Hello!! I’m the sorta busy Mom with two kids under the age of 3. I am the Mom that knows home cooked meals are best, but hasn’t come to love cooking yet. I love when I come across a blog who has a meal plan for their family for the week and shares the meal plan and shopping list. It makes me excited to cook when I see how others are feeding their families for the week. Sometimes meal planning and cooking seem so overwhelming. To me it seems like you have to have the main dish and what seems like a handful of different side dishes + dessert. Whew.. I guess I feel like I can’t manage all that with two little ones hanging on my legs. Mornings I seem to have more motivation. Crock pot meals take a large amount of stress off my shoulders. I guess I ought to try to prepare dinner earlier in the day that way when evening comes around we aren’t all so anxious and ready to give up and just go out.